Home » Energy » Can IGCC clean up coal ? I was wondering if we as Mankind could clean up coal and if it was worth the hassle. Indeed, Carbon Capture and Storage seems promising but is too little too late to solve our climate change problems. To an article on the New York Times, an alternative to CCS could drastically cut greenhouse gases emissions from coal-fired plants. Called IGCC (Integrated Gasification Combined Cycle) it sounds promising. Current coal-fired power plants burn pulverized coal using a combustion process that hasn’t changed in a half a century. 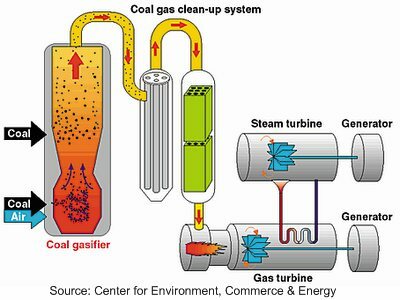 The new approach turns coal into a gas similar to natural gas, which runs through a device similar to a jet engine. Such plants can achieve near-zero emissions of toxic material and chemicals that form smog, and they require about a third less coal than regular coal-fired power plants to produce an equal amount of energy, which means about a third lower greenhouse gases. Beyond that, the promising technology of “sequestering” carbon dioxide — pumping it back into the ground to keep it out of atmosphere — appears for technical reasons to be impractical for conventional pulverized-coal power plants. But gasification plants have technical characteristics that should make “sequestration” of carbon feasible. A gasification power plant with sequestration would have around two-thirds lower greenhouse gases than a conventional coal-fired generating station. The first commercial gasification power plant, designed by General Electric for Duke Energy, is being built in Indiana. The main drawback of the technology is its cost. But one can believe that once climate change mitigation would REALLY be a priority to coal burning countries, IGCC will be worth implementing massively. This is nothing new. Basically, originally coal stations just threw big chunks of coal into the furnace. This is not very efficient. Coal is just like anything else you burn – if you put a wet log on the campfire, it’ll burn slowly and with lots of smoke, if you put dry sawdust, it’ll burn quickly. Next they learned to grind up the coal into smaller pieces, so it burned better. After that was drying the coal. People don’t think of it, but lots of coal has quite a bit of water in it. This is especially useful if we want to turn brown coal into fuel, as we do here in Victoria – brown coal has heaps of water and sulphur in it. After grinding up and drying out the coal, all you can do to make it emit less is turn it into a gas. What you do is to heat the coal with water, you get carbon monoxide and hydrogen. You remove the impurities (the sulphur, mercury, etc), burn the carbon monoxide and hydrogen with oxygen, and get carbon dioxide and water again. It’s not a new process, the USA has had a couple of plants doing it for some years, and long before that people were gasifying coal so they could get useful chemicals like ammonia. See the quite good wikipedia article on coal gasification. While you get less carbon dioxide emissions with a coal gasification plant, you get a lot more acids, ammonia, mercury and so on. That’s the disadvantage to the thorough burning of the carbon in the coal – not only do you bring out each carbon atom, but lots of others, too. And in the end, the efficiency of burning coal doesn’t matter. What matters is the total amount of carbon dioxide we put into the atmosphere. Whether the 1,000 tonnes of CO2 generated 1,000,000 kWh, 200,000kWh, 150,000,000kWh or however many doesn’t really matter – it’s 1,000 tonnes of CO2. Projects to capture and bury the carbon dioxide continue at the Western world’s most polluting power plant, Hazelwood. US$1,000/t to deal with the CO2 seems a bit pricey. Even solar panels are cheaper than that, in terms of CO2 emissions avoided. And they’re only managing 25 tonnes a day, not terribly impressive. Someone could probably plug a hole in a leaking steam pipe at Hazelwood and get the same emissions reductions. In the end, we are going to have to accept the fact that one day we’ll have to get along without burning stuff.